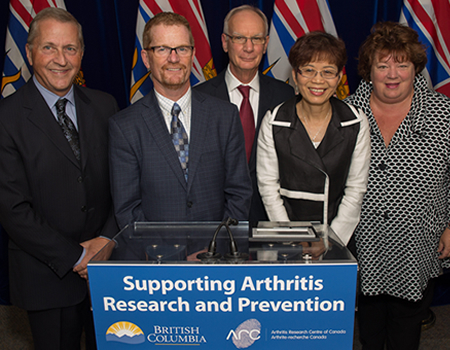 The Government of British Columbia’s Health Minister, Terry Lake, made an incredible announcement during a press conference on Tuesday afternoon: $3 million dollars will go to the Arthritis Research Centre of Canada (ARC) to help further developments in arthritis prevention, diagnosis, and treatment. “Applied research uncovers the answers that change and save lives,” said Dr. John Esdaile, the scientific director of ARC, following Mr. Lake’s statement. He added, "With further research into this complex illness, we can work to prevent arthritis, as well as reduce work disability, improve pain management, and address the special needs of arthritis patients in the province." Alison Hoens, a person living with arthritis, also spoke at the press conference: "Arthritis Research Centre scientists address and answer questions that are meaningful in enabling patients to keep moving, working, playing and contributing to life in B.C." In addition to this exciting news, Maureen Ilich was presented with the ARC Champion Award. The award is given to an individual or company that has made a unique and significant contribution to ARC’s growth and development. In 2012, the Milan & Maureen Ilich Foundation donated $4 million dollars, with part of the grant being the establishment of the Milan Ilich Arthritis Research Centre in Richmond. The Arthritis Research Centre of Canada was created in 2000 in recognition of the significant impact research could have on arthritis treatment in Canada. Patient-oriented, ARC conducts clinical research and trials related to arthritis prevention, diagnosis, prognosis, and quality of life issues. ARC is Arthritis Consumer Expert’s scientific partner and co-leader of the National Arthritis Awareness Program, which includes the program’s signature project, Arthritis Broadcast Network.